All States Auto Transport Company is a family owned and operated business with 25 years of family experience in the trucking and Auto Transportation industry. We understand how stressful and demanding Auto transporting can be. We offer a full live customer service staff 24 hours a day 7 days a week to ensure 100% customer satisfaction. 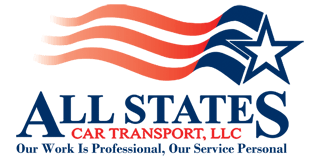 Is All States Car Transport insured? YES, All States Auto Transport is licensed, bonded and insured. Our FMCSA Motor Carrier Number is MC708093. Do you provide door to door services? YES, in most cases Auto Transport Companies provide door-to-door services. We will make every attempt to accommodate our valued customers. If accessibility is not possible, our drivers will arrange a reasonable alternate location. We accept Amex, VISA, Master Card, Discover, money orders, electronic transfer, or checks (If, received and cleared before delivery) for the initial deposit. The remaining balance will be paid upon delivery by cash, cashiers check or postal money order. Full prepayments may be accepted providing that it is arranged in advance and will require an additional fee. Why is my credit card information needed in advance? In order to expedite the process it is necessary to have a credit card on file, in good faith. This will ensure the best service with auto transport companies. There are no cancellation fees and you will NOT be charged if we are not able to find an auto transport company that satisfies your needs. Also keep in mind that we do not charge you any think until we assign your vehicle to a carrier servicing your route. NO, there are no hidden fees. Your personal estimate will include the fuel surcharge, tolls, door-to-door shipping, as well as insurance coverage. If your vehicle is not running or is oversized, we require that you inform us prior to scheduling the auto transport so we may provide an accurate estimate. YES, we solely provide fully licensed, insured and bonded carriers. Open carriers are insured approximately up to $125,000.00 in insurance coverage, per vehicle. Enclosed carriers are insured up to $250,000.00. Delivery time varies upon origin, destination, and the carrier’s schedule. All States AutoTransport representatives are skilled to provide accurate pick up and delivery times, when possible, however these dates are not guaranteed. Once a carrier is assigned we may provide an estimated pick up and delivery date in order to accommodate customer planning. We make every effort to expedite your vehicle’s safe delivery. Who needs to be present when you pick up or upon delivery of my vehicle? An authorized person must be present at the time of pick up and delivery, if you are not available. Please note, most auto transport companies are paid for upon delivery, you will need to provide your contact person with the necessary form of payment. At All States Car Transport, our mission is to make vehicle transporting a positive experience for each customer. When you trust us to ship your car, you receive peace-of-mind, expert advice and superior service. Contact us today for any questions on shipping your car today. Auto Transport FAQ's	Overall rating:	4.7	out of 5 based on 9	reviews.